Here's a couple of quadruped cycle-tests I've done with the Animation Mentor dog rig. 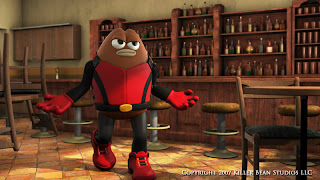 Just read on CGTalk that Jeff Lew is close to releasing his feature film - Killer Bean Forever. He spent 4 years doing a 85 min animated feature - alone! I totally admire people that does these kinds of things. They have a dream and they do it - however crazy it might sound. I'm sure the process of making this movie is worth it alone for Mr. Lew, but I do hope that it will pay off financially as well. The trailer looks really cool! Another guy who's website I came across several years ago, that did the same thing is Sam Chen. He spent 3 years and a lot of savings making his short film "Eternal Gaze". Reading his diary about the making of it is impressive and a huge inspiration. I bought the DVD a few years back and its a wonderful piece! Kudos to those who dare following their dreams all the way! Not too much going on lately. I've been busy practicing lipsync (which is darn hard) in my sparetime and at work things goes very well. Been working at Ambient Entertainment for 2 1/2 month now and still lovin' it. Just downloaded the latest podcast (Dale Baer) from The Animation Podcast and I was happy to hear that Animation Mentor now is sponsoring the site, which means that they're gonna put out a new podcast every month. This is awesome news! Those podcasts are a huuuuge inspiration and worth listing to more than once.